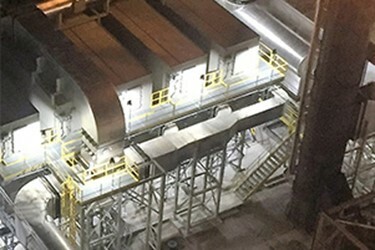 Particulate Control – Tri-Mer Ceramic Catalyst Filter system operates at much higher temperatures and can be configured to remove SOx, NOx, CO, mercury, dioxins, and Cement O-HAPs. Tri-Mer Ceramic Filter Systems are 99%+ efficient for the collection of submicron particulates. The typical level of PM emissions control at the outlet of Tri-Mer ceramic filters is 0.001 grains/dscf (2.0 mg/Nm3). This is true even with very heavy inlet loadings. Higher inlet loadings simply mean that the filters are cleaned more frequently with reverse-air pulse cleaning, while on-line. PM emissions of PM10, PM2.5, and submicron PM1.0 are captured with high efficiency. Tri-Mer filters provide PM emissions control by a means very different from that of traditional filters. The special qualities of the filter surface result in the PM emissions being captured on the face of the filter tubes without deep penetration into the filter walls and body of the filter. This allows for complete and repeated cleaning of the surface. This surface loading is an engineered feature of the Tri-Mer ceramic filters, and is not true for ceramic filter elements overall. Tri-Mer filter life is five to ten years, with most applications tending towards the longer life. Only over a period of years will the pressure drop of the filter gradually increase, from the new clean pressure drop level of 4" to 6" w.g. for the average application. System pressure drop can be lowered by adding more filter elements; alternatively, capital cost can be reduced by decreasing the filter count at the expense of fan horsepower. Standard reverse pulse jet methods, commonly used in fabric filter baghouses, are used for filter cleaning. A pulse of compressed air is sent down the center of the filter tubes and cleans the accumulated PM emissions from the outer surface of the tubes. The particulate falls into a lower bin and is removed through an airlock device. Filters are cleaned on-line, with no need to isolate individual housings or sections. For particulate emissions control, typical filter life is 5 to 10 years. These applications generally have temperatures above 300°F, with most applications in the 400°F to 900°F temperature range. The practical limitation is the carbon steel housings; the filters themselves are operational to 1650°F, but stainless steel housings and available valves and sensors limit applications to below 1400°F. The filters are often used when there is a high fraction of PM2.5 and submicron particulate in the PM emissions. Ceramic filter elements have the same efficiency as advanced fabric filter bags but can withstand much higher temperatures, have a much longer life, and are more expensive. Most importantly, the ceramic filters are available with embedded catalyst that also removes NOx at relatively low temperatures, as well as dioxins and Organic HAPS. Systems are also configured that will remove SO2, SO3, HCl, and mercury. A Tri-Mer system can be configured to be all-in-one: PM, NOx, SOx, HCl, dioxins, mercury and certain VOCs (O-HAPS). An add-on section can also remove CO.